Harbor East is quickly becoming the launching point for national chefs to enter the Baltimore dining scene. Leading the charge is Cindy Wolf, a Baltimore chef with many restaurants throughout the area. Her latest rendering is the rustic, yet elegant Italian kitchen known as Cinghiale. Directly translated, Cinghiale means wild boar in Italian – an interesting name although there weren’t boar items on the menu that evening. The décor features rich woods, iron chandeliers, white linen and wine bottles displayed throughout the restaurant. 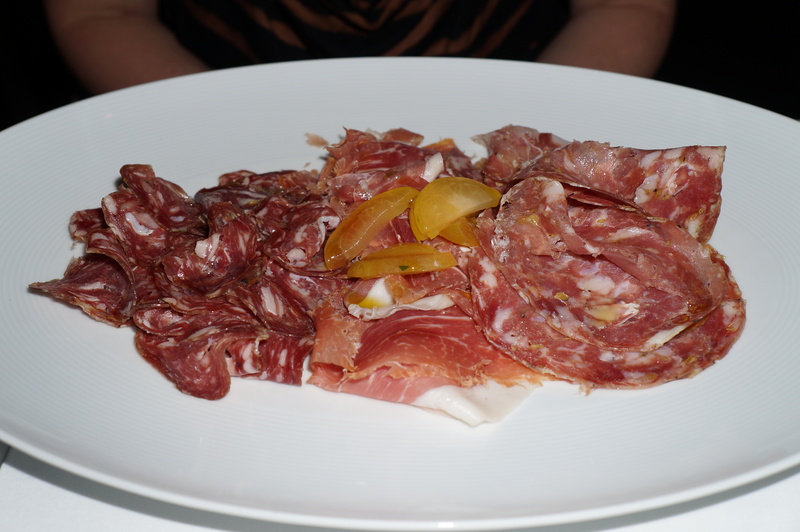 The salumeria in the middle of the restaurant immediately draws you in with its aromas of cured meats and vegetables. 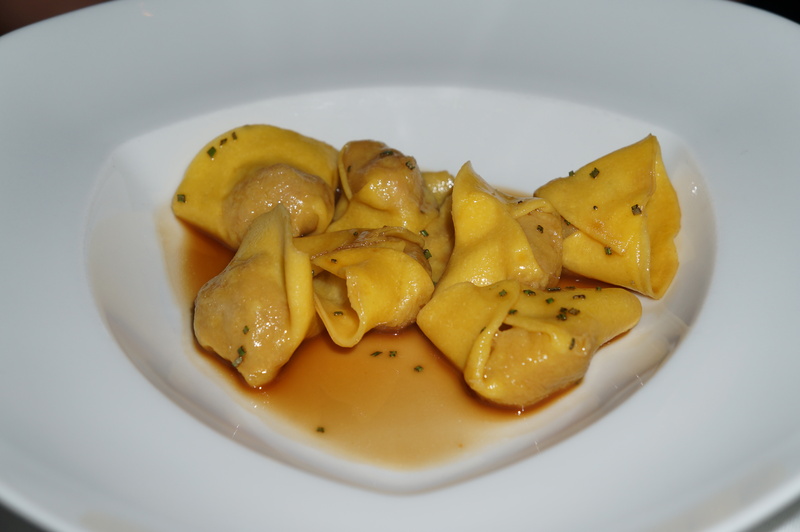 The menu has many options of modern Italian cuisine and is cleverly organized in a prix fixe manner. There is a $29 per person three course prix fixe menu, which features several rustic appetizers and entrees plus a dessert. I’m sure the items on this menu are delicious; however, I encourage diners to splurge on the $62 four course prix fixe menu which is much more unique and expansive. The wine list is over ten pages long with wines exclusively from Italy. 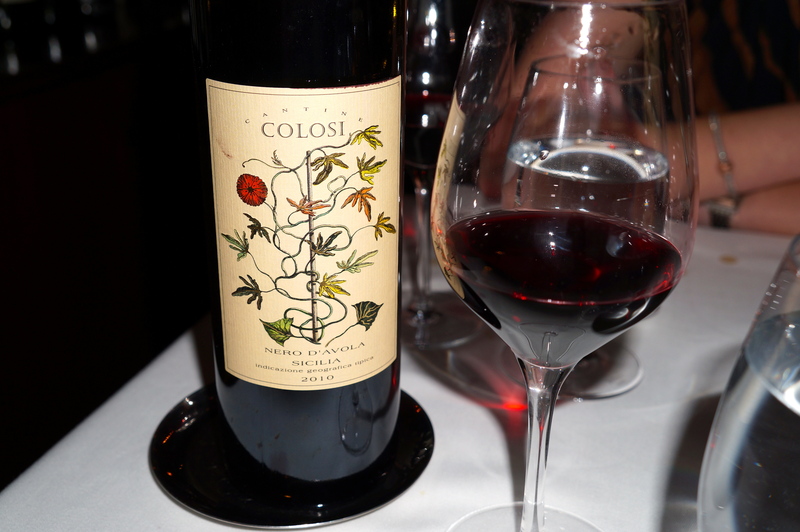 We eventually chose a wine from the Colosi vineyard in Sicily; a wine that our waiter suggested was comparable to a spicy cabernet. Once you settle in you are welcomed with warm, fresh, homemade focaccia bread, accompanied with the most delectable olive oil you will ever taste. 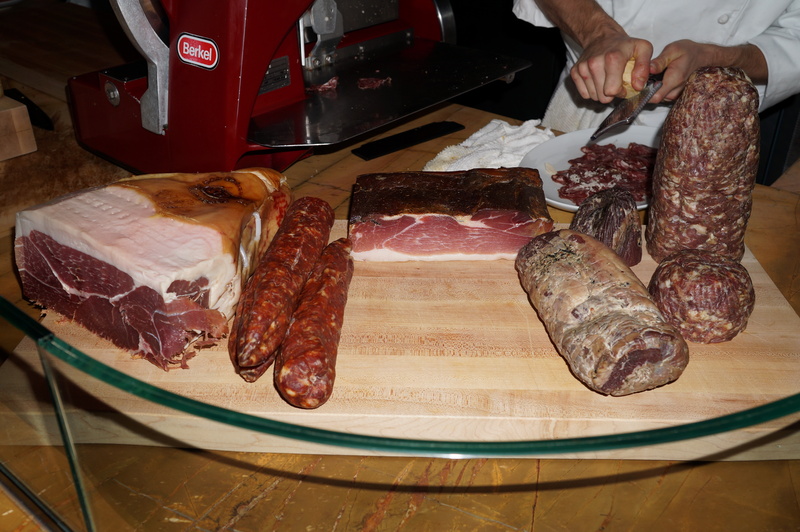 We started off with a chef’s selection charcuterie platter – featuring a large quantity of spicy salami, smoky prosciutto and some another fatty pork meat, all of which were truly delicious. 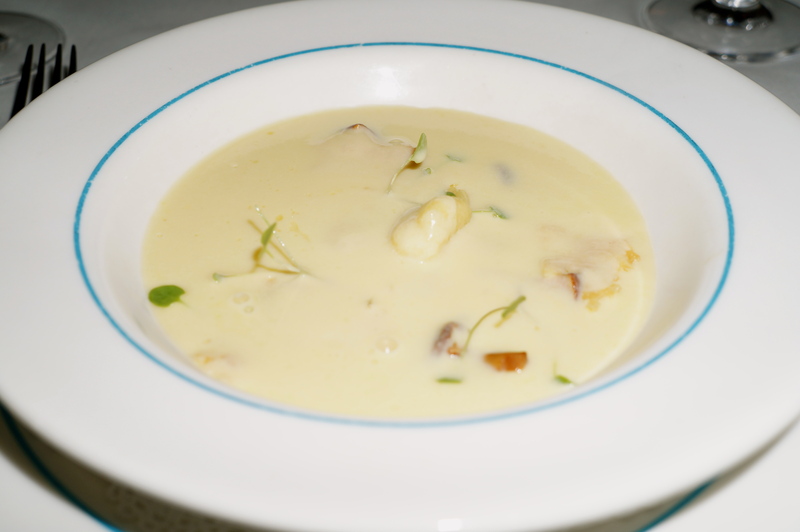 The sweet corn chowder is a work of art as it comes to the table, at which point the waiter pours the rich soup onto the gnocchi, parmesan crisp and morel mushrooms. The soup had a velvety texture with a natural sweetness from the local corn. 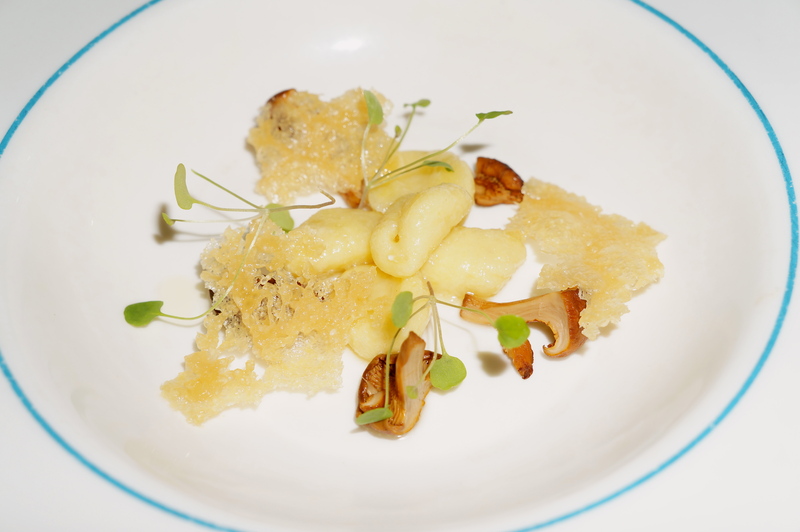 The parmesan crisp provided the perfect saltiness to the dish, with the mushrooms providing an earthiness to an otherwise very rich dish. The pasta dishes were completely homemade but were truthfully the low point of an otherwise amazing meal. We ordered the spaghetti chittara with lobster and the sausage-filled tortellini. 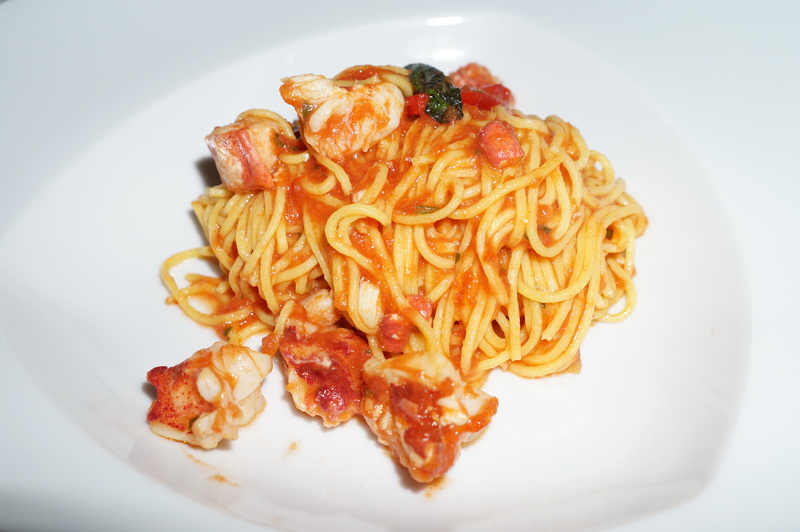 The spaghetti had a nice chew and texture but the tomato sauce wasn’t mind blowing while the lobster was under seasoned. The sausage filling in the tortellini was very tasty with accents of rosemary, but was way too salty – even for my palette. The tortellini itself was a bit too “al-dente”, which ruined the dish. The main courses however more than compensated for the mediocre pasta dishes. 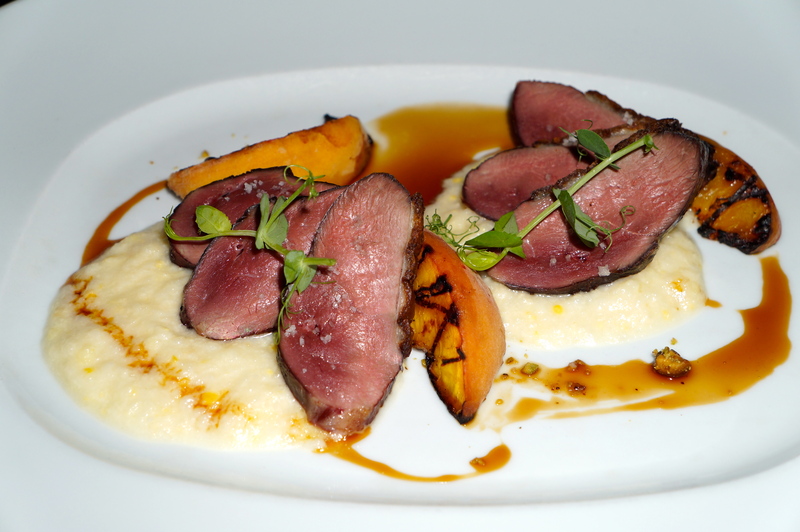 My girlfriend ordered the grilled duck with sweet corn polenta and grilled peaches. The duck was beautifully cooked to medium rare with the skin being rendered crispy. The polenta made for a perfect bite with the meaty duck, while the peaches were a nice palette cleanser between the other two rich components of the dish. I ordered the John Dory, which is apparently a weird looking white flesh, flaky flat fish. The generous portioned filet was seared until the skin became cracker-like while the flesh was still juicy and pearly white. The shaved celery with Italian olive oil on top was an unlikely perfect combination. 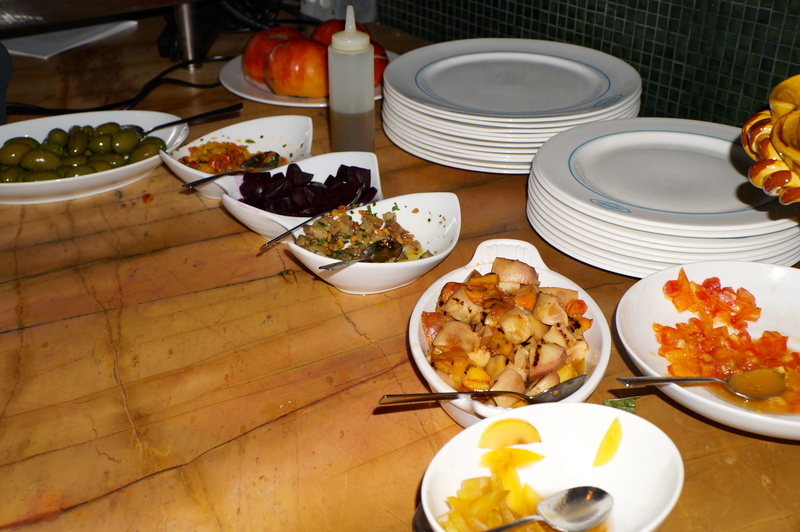 The roasted potato salad with olives was also nicely prepared, but I wish the potatoes were a bit crispier. The fish really was amazing though and I am glad that I had ordered it, as I was very hesitant at first. Our last course was the desserts. We tried to stray away from the traditional Italian treats and pastries by ordering the New York style cheesecake with fig preserve and the poached peaches with Italian sorbet. 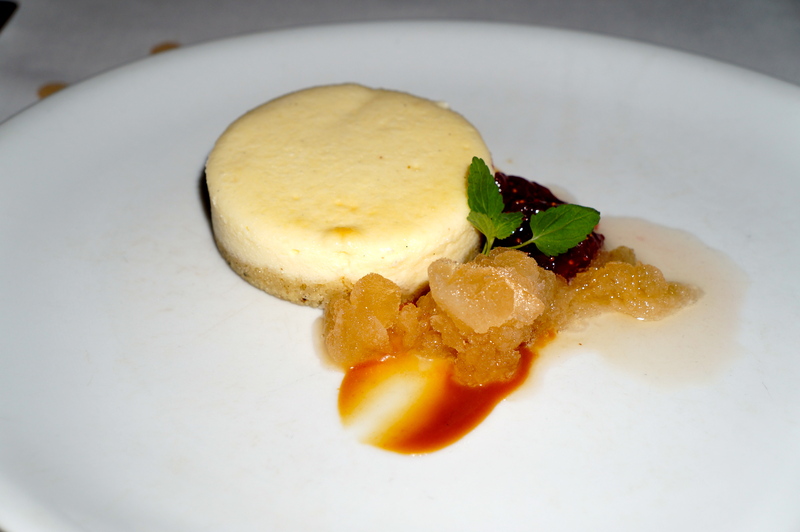 The cheesecake was a small hockey-puck portion which had crunchy crust with a lusciously soft ricotta cheese concoction. A softened crystallized ginger pulp enhanced the subtle spice coming from the crust with the fig preserve providing the sweetness. The white peaches were poached until softened in white wine. 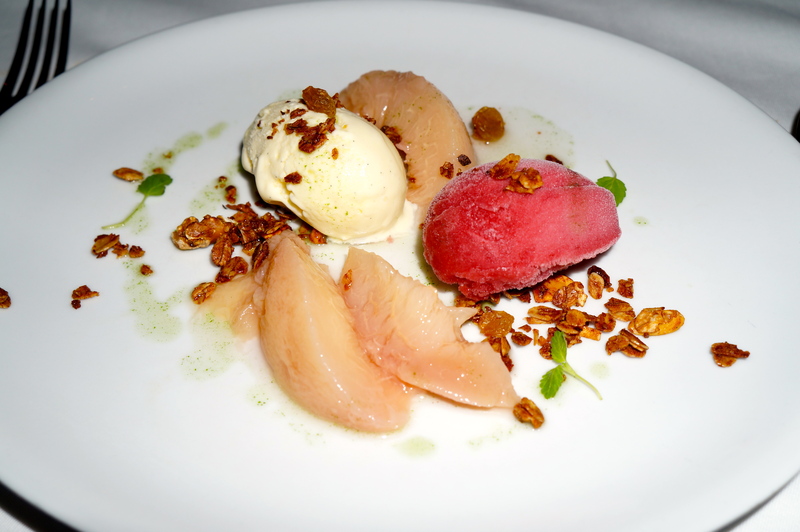 The peaches were paired with homemade rose water sorbet and vanilla bean sorbet. Granola made for a nice crunch amongst the other soft textured components of the dish. The entire dish was then garnishes with mint oil – just delicious. All in all, our meal at Cinghiale was a unique dining experience with some amazing food. 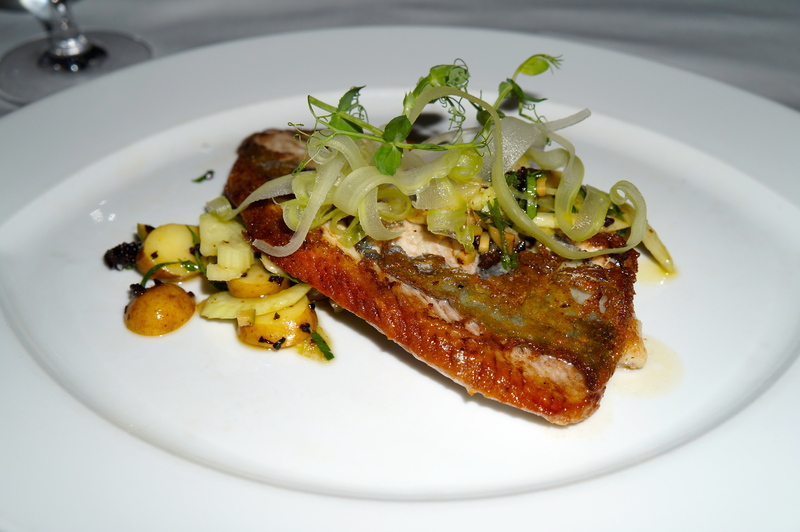 The food is beautifully crafted and presented in an elegant setting near the water. It is nice to know that Baltimore can still have fine dining of this caliber without having celebrity chefs buzzing to open a new restaurant on our waterfront. Well done Cindy Wolf, well done. I love reading your blogs. Thanks for sharing. I want go here now. That duck dish sounds amazing! Thank you Nancy! Me and your husband used to talk about food all the time when I was in the Lawyers Trust office. 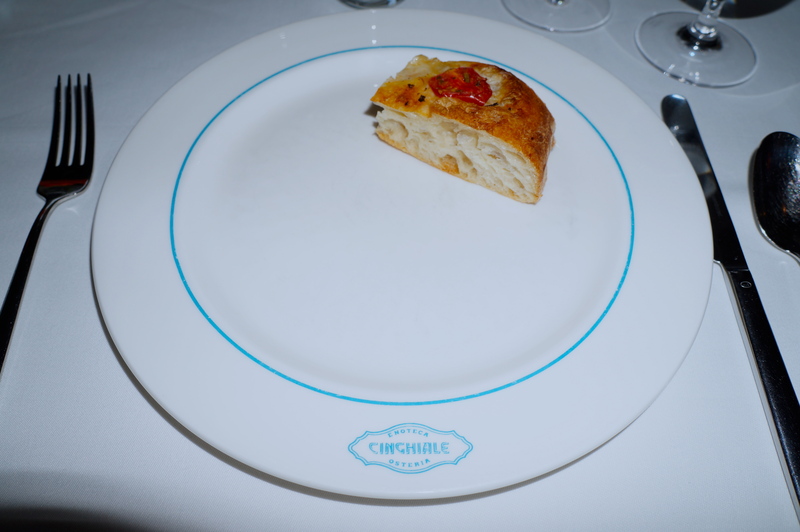 I hope you do have a chance to eat at Cingiale, it really is great, just expensive. Thanks for your support and say hi to Steve for me.